Paramount annonce pour le 4 décembre 2018, le film Mission: Impossible – Fallout (Mission : Impossible – Répercussions) en format DVD, Blu-ray et 4K Ultra HD, réalisé par Christopher McQuarrie et mettant en vedette Tom Cruise, Henry Cavill, Simon Pegg, Ving Rhames, Rebecca Ferguson et Sean Harris. HOLLYWOOD, Calif. – “The action is off-the-charts spectacular” (Peter Travers, Rolling Stone) in the “wildly entertaining” (Chris Nashawaty, Entertainment Weekly) global hitMISSION: IMPOSSIBLE—FALLOUT, arriving on Digital November 20, 2018 and on 4K Ultra HD, Blu-ray, and DVD December 4 from Paramount Home Media Distribution. 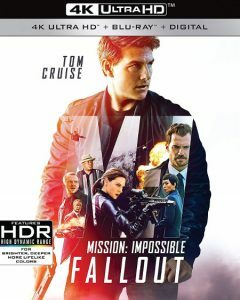 The exhilarating, action-packed movie will also be available as part of the MISSION: IMPOSSIBLE 6-movie Blu-ray and 4K Ultra HD + Blu-ray Collection, the perfect gift for the holidays.